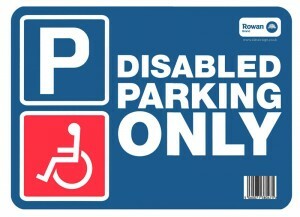 Disabled Signs are often taken for granted in everyday environments but they’re necessary and helpful for everybody. So if you’re looking for signage solutions either for individual or business use, we hope you will find what you’re looking for in our selection of Disabled cling signs and information signs. You can place the signs on any clean, dry glass surface, making them ideal for buildings or vehicles. We even supply special reversed designs formatted specifically for on the road. 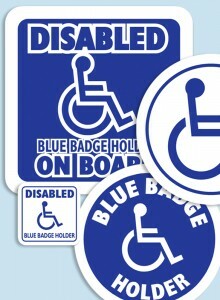 Don’t forget to take a look at our Disabled Parking Stickers under the ‘Warning Signs’ category. Imagine an unauthorised vehicle parked in your reserved disabled parking bay? This could cause many inconveniences and unnecessary stress, to be certain this doesn’t happen, our customers purchase the ultimate disabled parking sticker warning sign, therefore making sure that their parking is reserved. As you will see below, the sign is bold and eye-catching, leaving no doubt that the parking is not for others.